No Hassle Reporting of Crop Water Stress Enables Precision Irrigation. The Cermetek LeafMon system gives growers a physical measurement of plant water stress. Multiple environmental sensors are used to calculate the Crop Water Stress Index (CWSI) value. With CWSI in hand the grower can closely manage irrigation timing to maximize crop water efficiency and employ strategic deficit irrigation techniques. The LeafMon system includes the LeafMon crop water stress sensor, the AquaMon communications hub and Cermetek’s web based software application, RSVP (Remote Sensor Viewing Platform). 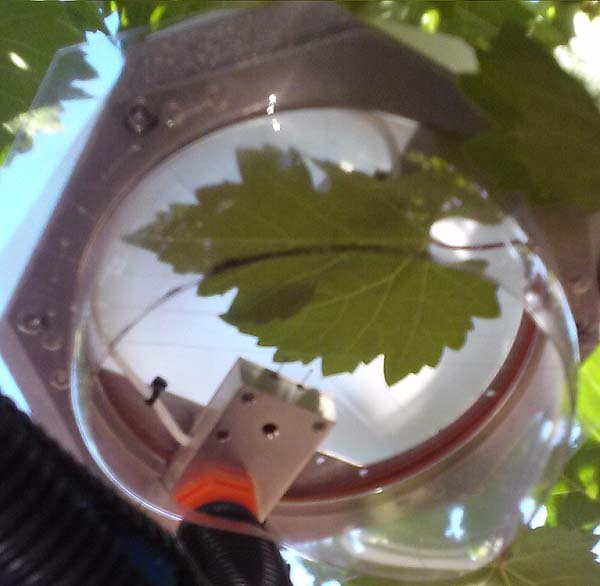 The LeafMon sensor holds a target leaf and measures the environmental parameters in and around that leaf. The AquaMon node collects the sensor data and uploads it over the cellular network to the web server hosting RSVP. RSVP calculates the crop water stress index from the collected data and makes it available for 24/7 display. Provides automated, real-time monitoring of crop water stress. All sensors are non-contact and non-invasive so as to not harm the leaf or adversely affect plant behavior over the entire growing season. The AquaMon node automatically collects the sensor data and moves it to the web server where RSVP calculates the crop water stress index. The RSVP web software makes the water stress data available the grower 24 hours a day, 7 days a week. Will not damage the Leaf under test. The same leaf can be monitored for the duration of the growing season. Makes the water stress data available not only to the grower but to any crop advisors permitted to access his RSVP account.